Tim, Author at Solar Love! The New Jersey Board of Public Utilities has voted to approve a $447 million expansion on PV projects in the state of New Jersey. This landmark decision helps establish the goals Governor Christie laid out in his Energy Master Plan. In an effort to increase its renewable energy generation, Malta has started a photovoltaic subsidy and rebate scheme worth €21 million. The European Regional Development Fund (ERDF) is co-financing the fund and will pay a feed-in tariff (FiT) rate of €0.22/kWh for each unit generated from PV panels and fed into the national grid. 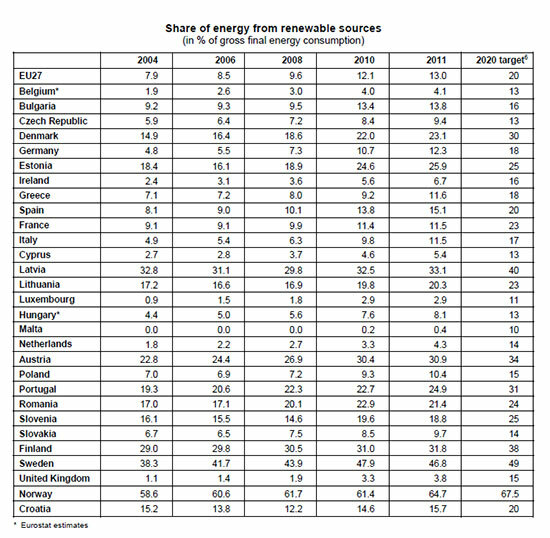 Eurostat, the statistical office of the European Union has just released the latest figures that highlight the development of renewable energy sources in energy consumption in the EU27 and the member states for 2011. The new figures show that renewable energy covered 13% of the European Union’s energy consumption in 2011. Going back to 2004, the results showed that renewable energy covered just 7.9% of the European Union’s energy demand at that time. A significant increase was reported by 2010, where it had risen to 12.1% and the latest report for 2011 shows that renewable energy covered 13%. As the authority states, the share of renewable energy in the gross final energy consumption is one of the key indicators of Europe’s 2020 strategy, which aims to generate 20% of its energy from renewables by 2020. According to the current figures, almost all EU member states increased their share of renewable energy between 2010 and 2011. While some remained stable between 2010 and 2011, such as Luxembourg with 2.9%, there were a few that saw slight declines in their renewable energy (Romania, Slovenia, and Sweden). Even though Sweden showed a loss, it still held the highest share of renewable energy generation, with 46.8%. The Scandinavian country was followed by Latvia (33.1%), Finland (31.8%), and Austria (30.9%). Meanwhile, the lowest levels were observed in Malta (0.4%), Luxembourg (2.9%), the UK (3.8%), Belgium (4.1%), and the Netherlands (4.3%). For you next afternoon DIY project, why not create a Hot-Box Solar Oven? This is one project that can really come in handy during a power outage or on a camping trip. This sun-fueled solar oven can bake your favorite dishes in no time and is a great way to conserve energy on those sunny days. The great thing about this DIY solar oven is that most of the materials can be found lying around in the garage or home. If you’re like me and always keep scraps (… because you never know when you might need them), now’s your chance to justify to the little lady why you have been keeping that stuff for so long. Construct an open-top box using ¾-inch plywood for a 14 x 15½–inch bottom. Use ½-inch plywood to make four 7-inch-tall sides. With a vise and pliers, bend the mending plates to 135-degree angles. Fasten two plates to each box side with 1-inch No. 8 bolts, washers, and nuts. Cut pieces of rigid foam insulation to line the box interior. Glue the foam to the plywood using construction adhesive. Cut and glue drywall panels to fit on top of the foam. Paint the interior black. Nail wood trim over the edges of the foam and drywall. Cut the molding into four 9-inch lengths. Center the glass pane over the opening. Put the moldings around the glass perimeter. Nail them down to steady the pane. Glue the knobs to the glass. Prep food in a black enamel­ pot with a lid. Set the pot in the box. Replace the glass. Prop up the oven at an angle so the sun and reflectors shine directly on it. Use an oven thermometer to gauge heat. Note: This oven does not bake as quickly as a regular one. Double note: Wear oven mitts to handle the ceramic knobs—they get hot! As with any DIY guide, feel free to make your own alterations and experiment with your own designs. Always try to make use of the scraps you do have lying around and enjoy the rewards of building it yourself. Please feel free to share your own designs or experience with building this great DIY solar oven project! Recently, Time Magazine recognized Elon Musk as one of the 100 most influential people in the world — an honor that is deserving of Mr. Musk for all that he has done to help solve environmental, social, and economic challenges. Elon Musk is an engineer and entrepreneur who holds a physics degree from the University of Pennsylvania and a business degree from Wharton. Musk got his start when he co-founded Zip2, an Internet software company that he sold to Compaq in 1999 for over $300 million. Soon after, he co-founded and formed PayPal, which was purchased by eBay in 2002 for an astounding $1.5 Billion. But he didn’t stop there. He has since gone on to create SpaceX and Tesla Motors, and he helped co-found SolarCity, all of which have seen success under his leadership.